The One Condos At One Bloor West is a new residential Condos development by Mizrahi Developmentand and Foster + Partners. It located at 1 Bloor Street West in Toronto. the building will be a 80-storey retail and residential Tower at southwest corner of Bloor and Yonge Streets, it will be Canada’s new tallest building. 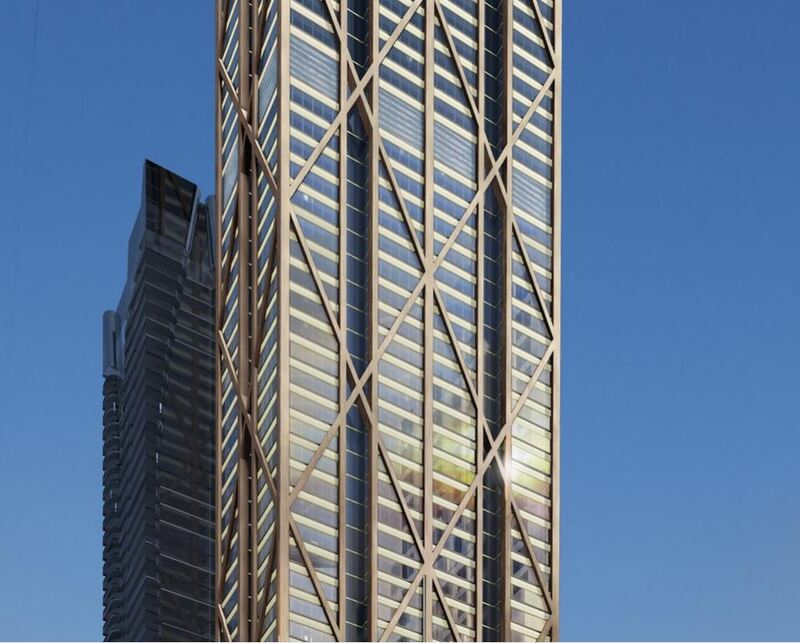 this will be 318 metres or 1,043 feet tall with total 416 Units. Units size From 500 sqft to 5700 sqft. Toronto is an expansive building with many skyscrapers towering over the residents on the ground. With so many people living there, upwards living has become the norm and condominiums are a hot commodity for students, growing families, retiring couples, and everyone in between. 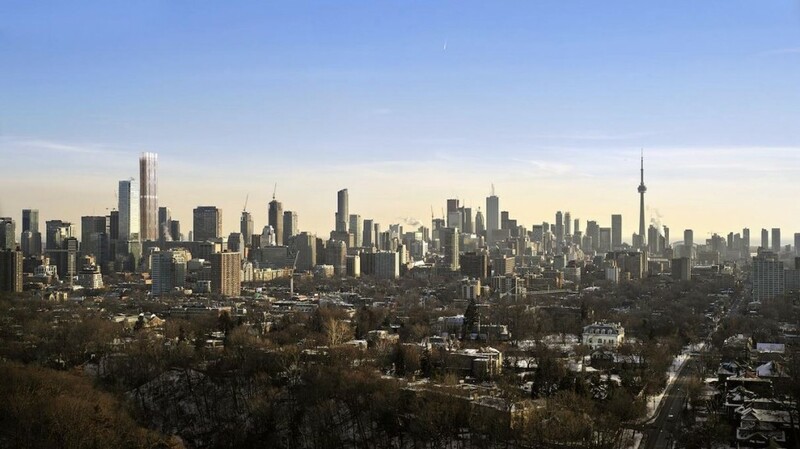 To accommodate the discerning residents of Toronto, Mizrahi Developments has put in an application for a brand new condominium building that will feature over eighty stories and will have an extensive number of residential units within it. This building will be, by far, the tallest building in all of Canada and will surpass the Mirvish and Gehry West Tower (only 1,000 feet) as well as the First Canadian Place (978 feet). The application is for the development of The One Condos – an eighty story tower set to be placed 1,043 feet high. It is going to be an absolutely spectacular feet of engineering and architecture, especially with the famous Norman Foster behind its design. Its location is going to be at the intersection of two buzzing streets in the center of Toronto: 1 Bloor Street West at Yonge and Bloor. The intersection of these two main streets is currently inhabited by a deteriorating clothing store called Stollerys. This outdated fashion shop is set to be demolished and replaced by The One Condos and this news is most welcome to prospective residents and current inhabitants on both Yonge and Bloor. For prospective residents of this stunning new condominium building, the location itself is a huge perk. It’s a major intersection within the heart of Toronto, and offers an outstanding location close to major transportation, great shopping opportunities, schooling, parks, and more. Additionally, residents of The One Condos, will also be excited to hear that the inside of this particular condominium will feature an amazing array of luxurious and convenient features. These features include a stunning atrium that simply wows anyone who first steps inside the doors. From there, the first eight floors of The One Condos will feature extra high ceilings to accommodate a plethora of retail space. These retail partners will be hand-picked to allow residents of The One Condos incredibly convenient perks just seconds from their doorsteps! In addition to multiple retail partners and luxurious shops within the lower flowers of The One Condos there will be five hundred and sixty different residential units that are completely customizable. Prospective buyers looking to really customize their future home to their needs have zero columns or pillars to work around meaning the entire unit is theirs to do with as they please. Overall The One Condos at 1 Bloor West is set to be one of the most spectacular and desirable condominiums in all of Canada. It’s towering heights allow residents unprecedented views of the beautiful city of Toronto, while it’s convenient location and luxurious design simply adds a decadent icing on the cake. Those interested in purchasing a unit at this location are advised to keep checking for more information as the project moves from the application to the implementation stages. 1 Bloor West Condos Walk Score is prefect of 100 out of 100. the Transit Score is nearly perfect of 97 out of 100. The One Condo Toronto At 1 Bloor West Directly Connection to the PATH and Bloor-Yonge Subway Station. An application has been filed by Mizrahi Developments for a project by the name of The One Condos. the proposal is for an 80 storey tower that will include residential units as well as plenty of retail space. With so many stories, should this proposal be accepted, The One Condos would be the tallest residential tower in Canada. The First Canadian Place in Downtown Toronto is the current record holder. This is 978 ft high. There is also the Mirvish+Gehry west tower that is 1,000 ft high, which has been given approval, but is still in its construction stage. But The One condos in 1 bloor west is going to be 1,043 ft tall, so it will be the tallest skyscraper in Canada. The tower has been designed by Norman Foster, and it promises to be a spectacular building in Toronto. The One Condo is going to replace the clothing store that is there at the moment. The clothing store, ‘Stollerys’ has been for over a hundred years, and now 1 Bloor West Condos will lead to its demolishing. But being right at the intersection of Yonge and Bloor Sts., this development is surely going to be erected in a great area. This is not just a major intersection, but also a great transportation hub. The first eight floors will be higher than the norm. These will be for 150,000 square feet of retail space that will be set up around a tall internal atrium. As it is the tendency with Foster + Partners, a diagrid structure is expected. The tower will include multi-level retail space that is set to include lots of luxury retail outlets. These will be surrounded by terraces. There are going to be 560 residential units which can also be customized according to the buyer’s wishes and preferences. Since there is going to be an exoskeleton construction, there are not going to be any columns and pillars in the way, so custom design will be made possible. Way down below, The One Condos is going to be connected to the subway system via the Bloor-Yorkville PATH network. There is also going to be a big parking garage below, where there will be 600 spaces that shall be valet-accessed. The One Condos promises to be a record-setter not just because of its imposing structure, but also because the architects are backed up with several other successful projects. Having said that, Sam Mizrahi is a novice developer, who is however very keen to succeed as one can say that he is going big from the very start. Luxurious surroundings, interesting features and amenities are sure to be included to guarantee an elegant lifestyle for all the residents.